Recently Le Cordon Bleu Paris participated at in-bound tourism to France workshops organized by Atout France - the French government agency for tourism. These workshops were held in Sydney and Melbourne as bi-annual promotions showcasing French touristic organizations and tourist destinations, especially in Paris. 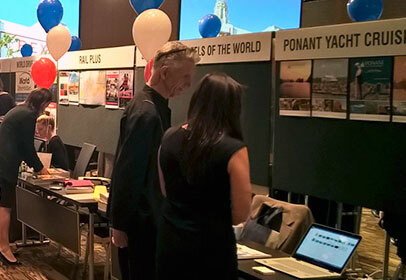 Between 400 and 600 travel agents in Sydney and Melbourne attended the event to get the latest information on attractions and services available to visitors to France and in particular its capital. As a first-time participant, Le Cordon Bleu Paris sought to promote its wide range of short courses to visitors to Paris who have an interest in food. As most travel agents observed, gastronomic tourism is now a major aspect of leisure travel and is growing exponentially - especially in destinations such as Paris. Beyond simply enjoying classic French food, visitors to France are increasingly seeking more direct engagement with food preparation in an interactive mode. Of course wine is the indispensable partner to fine food. The Paris school also offers courses in Food and Wine Pairing and Wine and Spirits Initiation. Nor are younger visitors to Paris forgotten! Le Cordon Bleu runs Les Petits Cordons Bleus (for 8-12 year olds) and Future Chefs (for 13-17 year olds). There are even parent-child duo classes such as My First Decorative Breads. Courses are available to individuals and groups. Individuals on extended stays in Paris may even enrol in the classic Le Cordon Bleu Diplôme de Cuisine and/or Diplôme de Pâtisserie programs, progressing from Basic through Intermediate to Superior stage. During the Atout France workshops, representatives of Le Cordon Bleu also highlighted the organization’s brand new flagship school - just two months old! Comprising 4,000 m² of state-of-the-art Culinary Arts and Hospitality Management training facility, Le Cordon Bleu Paris is located directly on the banks of the Seine near the Eiffel Tower in the 15th arrondissement. Staff at Le Cordon Bleu Australia can facilitate enquiries and enrolments into culinary short courses for visitors to Paris.